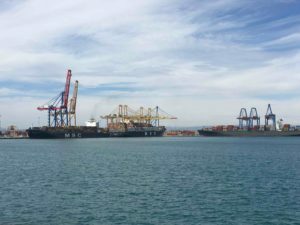 Kalmar, part of Cargotec, has announced that it was contracted by Noatum Ports to perform specialised repair work on a ship-to-shore crane located at its container terminal in Valencia, Spain. The work is scheduled to last 24 weeks and is to be completed in the beginning of Q3 2018. Noatum Container Terminal Valencia is part of Noatum Ports, a leading maritime terminals operator in Spain. Boasting a quay line of 2.3km, with 16m draft and a total area of 158ha, the terminal is one of the main gateways for container transportation at the Iberian Peninsula and the natural port for the Spanish capital, Madrid. Served by all major global container-shipping lines, the terminal’s location close to the Suez-Gibraltar axis connects it with the main interoceanic routes. Following an incident with a vessel in late 2017, one of the terminal’s 20 STS cranes suffered damage and now requires extensive and complex repairs. Noatum CT Valencia turned to Kalmar to plan, engineer and execute the repair work and return the crane to normal operation. The two companies have a long history of cooperation, with Kalmar having supported Noatum with maintenance, upgrade, repair and relocation services for a number of years.